Food Allergy and Intolerance Ink: Prêt a Mang ... Er? Prêt a Mang ... Er? 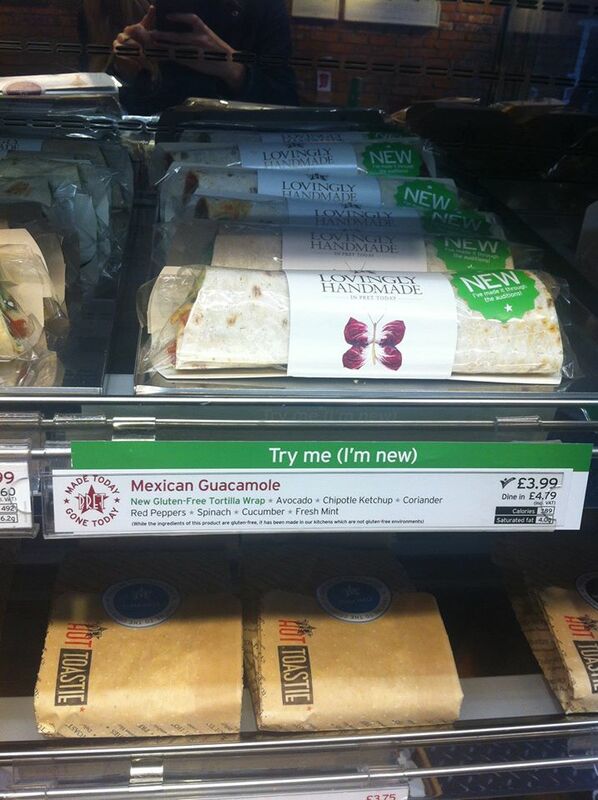 Last summer Pret launched the 'Mexican Guacamole', made with a gluten-free wrap. It carried a disclaimer: "While the ingredients of this product are gluten-free, it has been made in our kitchens which are not gluten-free environments". Blogger Kevin at Gluten Free by the Sea queried their head office about it, was given basic explanation of hygiene / cross-contamination controls and told: "We can't call it gluten-free because of the risk of cross-contamination". The Mexican Guacamole wrap appears lately to have been supplanted by a Chicken Harissa, also made with a gluten-free wrap (which I understand is Newburn Bakehouse by Warburton's, incidentally) but the Pret line on it is just the same, as they confirmed in an email to Kevin last month. His full account is worth a look. Read it here. What can I Eat? is the title of Pret's Allergen Guide. Each page is headed up "I Can't Eat [Allergen] So I Can Eat" - under which all the food and drink options Pret offer made without that allergen are itemised. But between the list and the header comes a red-inked kicker. On the gluten page, that disclaimer reads: "The ingredients in these products do not contain gluten. 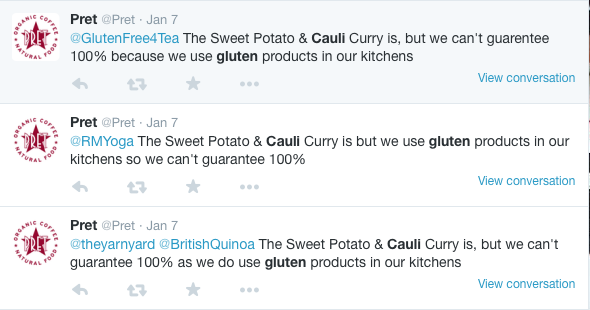 Although we take every reasonable precaution we cannot guarantee that the products will be 100% gluten free as we use gluten ingredients in our kitchens"
Pret's social media operators have been fielding queries on all these issues for months, not always consistently or correctly. 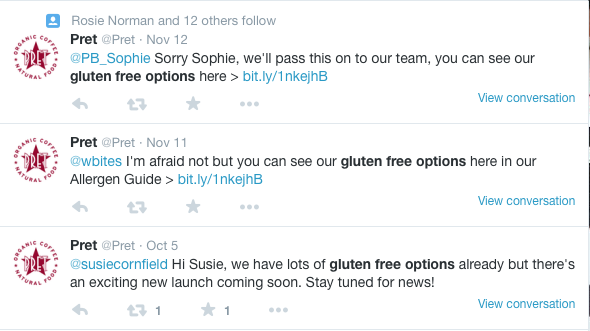 For instance, although they claim they can't call their made-on-site products gluten-free, they regularly describe them so on social media, often linking to their allergen guide. Sometimes they call their Chicken Harissa 'gluten free' - and sometimes they say it's made with a 'gluten free' wrap. When consumers ask them whether products are 'gluten free' - as all the ones below did - they often tell them yes - and then follow with a disclaimer. So much is wrong with the language Pret are using, it is difficult to know where to start. The message 'made in kitchens which are not gluten-free environments' is in my view fairly useless. Not many kitchens are 'gluten-free environments', and yet gluten-free meals can sometimes come out of them - although Pret seem to feel this is not presently possible in their case. Or perhaps I should say 'guaranteeable', rather than 'possible', because Pret seem obsessed with guarantees. Yet this expression is also inappropriate in food allergen contexts, to my mind, because there are no guarantees in life, as Kinnerton, producers of nut-free chocolate, clearly argue on their site. To me, it is a matter of confidence: does Pret have enough confidence, with the correct training and controls in place, and the willingness to put their neck on the line, and make a gluten-free claim? No, is the present answer. Or is it 'yes'? Because they appear to be making those claims in conversation, and they also seem to be relaxed about allowing consumers to infer a product does carry a gluten-free claim when it may not. Take a look at the picture of the original Mexican Guacamole on Kevin's blog. Nice large green lettering for the 'gluten free'. Much smaller disclaimer. Lunchtime ... distracted by colleagues ... dozens of hungry office workers ... in a hurry .... can you be certain you'd check, or is it easy to miss? And, for that matter, would those with all other sensitivities be able to ascertain the 14 allergens info too? What does gluten free mean, Pret? I am not confident 'gluten free' is fully understood chez Pret. They told me days ago that "we only label products gluten free when we can guarantee [ARGH!] that they don't contain gluten". Newsflash, Pret: gluten free products can contain gluten. They can contain up to 20 parts per million. And "... don't contain gluten" implies zero gluten - which is neither expected nor achievable nor measurable. Their constant references to '100% gluten free' - or to not being 'completely free from', as on their Chicken Harissa page - or of their inability to 'guarantee 100%' tells me that they just, do, not, get it. I have blogged before about why '100% gluten free' is misleading and - on labelling - illegal, and "We can't guarantee 100% gluten free" is a car crash of a statement in a document purporting to serve as an 'Allergen Guide'. Titling a page "I can't Eat Gluten So I can Eat" and also making a gluten-related disclaimer appears to be a contradiction of one's own choice of heading - and shows ignorance of coeliac disease. For it is coeliacs who are the ones who really "can't eat gluten" (in concentrations greater than 20ppm), and it is they who need 'gluten free' labelling in the absence of gluten-related disclaimers. The term they are looking for - desperately - to describe the products under discussion here is "no gluten containing ingredients". Why is this not being used? They should stop using the expression 'gluten free' with respect to these products unless there's a 'not' before it. They should stop referring to gluten content, stop referencing percentages. And they should stop declaring themselves unable to guarantee the unguaranteeable. When asked whether such products are gluten free they should say no, not yes. They should then say they are NGCI, and if they wish, explain cross-contamination protocols. 14-allergen information should I feel be more accessible - I was unable to confirm that it's available anywhere other than online. An appreciation that the cereals containing gluten are the allergens - and should be named - seems absent and needs to be addressed. Their advisory / defensive warning must change. Again, talks of 'guarantee' and '100%' should be abandoned. The correct expression is for Pret to work out - they clearly need advice, and I understand they're getting it from Coeliac UK - but it should be factual not speculative. "Although we take every reasonable precaution, please be aware that we use gluten-containing ingredients in our kitchens" is not ideal, but better than what they have. They need to appreciate that they are currently, in effect, making a broad "may contain allergens" declaration (albeit in an arguably cack-handed way) on all their on-site foods - as the 'can't guarantee that any of our products are completely free from any allergen' disclaimer on their web pages demonstrates. As you can see below, the FSA are not keen on this sort of thing. "May contain" labelling should only be used, as I understand it, when there is considered real risk to the consumer - and if there's risk to the consumer of finding crustaceans in their still mineral water or celery in their banana, as their Allergen Guide bafflingly suggests, then Pret are in far more of a mess than I'd imagined.